For those of you wondering about disruption of service to this blog, Jim's Eclectic World, the Yellowstone Newspaper, and almost all of The Magic of Yellowstone Web site (at least that hosted on http://www.yellowstone-online.com/ domain - the http://www.yellowstonemagic.com/ pages were up the entire time) were down for the last 24 hours. The reason - all the bandwidth that I was allowed from my Web host for the month of August had been used up. That's actually good news in a strange way. That means there is more content being accessed by more people this month than in any other month of the history of the site. The newspaper is the biggest mover, news about fires in Yellowstone bringing in more and more new readers. I don't look at statistics for large portions of the site. The blog actually has been lower than other months, I think in part because of the way that Google has been indexing blogs. Some pages are very hard to find or don't show up at all on Google (that once did). Even so, visitorship to the site is growing, forcing me for the first time in many years to spend money on the site (less than $25) for something besides domain name registration. I apologize for those of you who had to search for news on Yellowstone, Grand Teton, and the ecosystem at large the old fashioned way. However, the problem has been corrected, and we should be good to go for awhile. While Part 3 of the series on Yellowstone and myths is still in the hopper, I wanted to do a very short follow up on what is happening with the Woodbridge Workers Committee. Right now, in Prince William County in Virginia, a resolution is in process of going forward that would be among the most restrictive against immigrants in the entire nation. A march (on September 2) and a boycott (this week) are in the works, and there is a call out for donations. If you can donate, please contact John Steinbach of the Woodbridge Workers Committee. In any event, today's Washington Post does a piece on Mexicanos sin fronteras spokesperson Ricardo Juarez, who is also with the Woodbridge Workers Committee. Juarez was one of the people who spoke in March during a panel on Zapatista organizing during the DC Social Forum. I wrote out the entire transcript of that, including Ricardo's remarks, on Beltway IMC. This goes beyond the struggle about immigration, this is also a struggle for grassroots solidarity. There are those who support the struggle of immigrants but would not support their full participation in the tactical choices of their own struggle. This protest in Prince William was decided by the people most affected. I think it's very encouraging to see this happen not just from the standpoint of the immigrants' struggle but also from the standpoint of making sure that people's struggles actually reside first with the people and not simply with organizations that claim to represent them. People like Ricardo and the Woodbridge Workers are the real deal. For those interested in what's going on in Prince William County, please check out Mexicanos sin fronteras. Essay series thesis: Many of the traditional myths about Yellowstone National Park are not only false, they are far worse: They point to ideas that are wrong about society at large, reinforcing exploitation and disempowerment. Nevertheless, Yellowstone lends itself well to myth; we should consider new ways to celebrate this magical place. Read Part 1. Part 2 argues that the myths considered in Part 1 are harmful, often reinforcing paternalistic and hierarchical ideas that have been passed off as virtues. In some cases, the myths reinforce traditions that either should be challenged or should be made less exclusive. In looking back at where we are, we can see what still lays on the horizon of our journey, even if we don't state things as precisely or as correctly as we could. 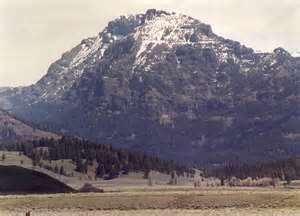 The background of the photo headlining this essay shows Abiathar Peak. Back in 2005, I hiked the Lamar River Trail and later scanned some photos from the journey. I believed I was looking at The Thunderer. That is how I labeled the picture until one day I had a peculiar hunch that I was wrong. In examining photos and reading about the mountains in northeastern Yellowstone, I realized that the mountain I was staring at - with Soda Butte and a couple of tiny hikers in the foreground - was in fact Abiathar Peak. If I had continued on believing that The Thunderer was Abiathar Peak, I doubt I would have come to any harm. Perhaps, I would have been surprised one day when I was hiking on one and discovered that I was on the other. Yet, there are no mythic consequences to my belief. I have not pointed to any other truth. The Thunderer seems to be quite the mythic name - and perhaps those who named it are to blame for my mistake - but on the whole, no one is perpetuating a myth by misnaming their photographs. That is the central point of Part 1 of the essay. Myth is distinct from falsehood. Yet, some of the historical falsehoods that we considered are in fact mythical. Their being mythical, that is the purported use of a story to illustrate some other truth, does not necessarily make them successful at their ambitious aims. While some myths are quite successful in pointing us to a rich discussion of truth - for example, consider the thousands of years people have pondered and wondered about Plato's "Parable of the Cave" in Republic - others can have the tendency to reinforce unsound judgments about the world. the myth that Jellystone - complete with Yogi Bear and friends - is synonymous with Yellowstone. Teddy Roosevelt not only did not give us Yellowstone National Park, but also we shouldn't even believe that Yellowstone was ever anyone's to give. I am going to go after the largest game of all first. As I've worked on gathering news about Yellowstone, it's not uncommon for me to find people who give thanks to Teddy for setting aside Yellowstone. I find that I can't help correcting them, perhaps because I have a peculiar disdain for this particular belief. Most people are happy that I have set them straight, but most people go on to say that they are still thankful for all that Teddy Roosevelt did to preserve public lands. Instead of feeling less thankful to Teddy, they ultimately feel just that much more thankful to President Grant, who signed the act creating Yellowstone National Park into law. It won't make me popular among a lot of circles to say it, but I am not thankful to Teddy Roosevelt (or U.S. Grant). See "The Only Good Indian is a Dead Indian" by Wolfgang Mieder for an interesting discussion of the reference. Might this quote be falsely attributed? It hardly matters; the actions of the man are more indicative of the environmental destruction and genocidal instincts of the man. Roosevelt, the eastern man of wealth, traveled west and loved to hunt bison. While Roosevelt was not one of the market hunters who wiped out bison for profit as part of the U.S. policy (as part of Grant's so called "peace policy") that was used to drive Plains tribes into the reservations, he was an eager hunter. He certainly had no opposition to the slaughter until he and others realized that the extinction of the American bison would also mean the extinction of sportsmen like himself. He and other wealthy men founded the American Bison Society not so much to protect the animals and certainly not to protect indigenous interests but rather to protect something of the way of life that had been lost as a result of the mass buffalo slaughter. See "Teddy Roosevelt and The Winning of the West" for more evidence of Roosevelt's justification for genocide. When Theodore Roosevelt was President, the United States Forest Service was founded. Lands that had been set aside as forest preserves were organized under the Forest Service and placed under the United States Department of Agriculture in 1905. In fact, that was the main effect of the law that Roosevelt signed. Prior to 1905, forest lands that had been set aside in 1891 (under Benjamin Harrison) were under the Department of the Interior, the same department that had at least nominal control of Yellowstone National Park (it was more than nominal, but at that time, the cavalry enforced laws in Yellowstone). The new Forest Service was in the hands of Gifford Pinchot, who believed in the "multiple use" theory of public lands. The forests were there to serve human interests. As such, preservation was not the intrinsic aim of the new Forest Service, but rather the usefulness to various sectors of the population. The historical Teddy Roosevelt supported the plunder of land and resources from native inhabitants and supported conservation only so far as it preserved the kinds of uses that Teddy favored. While the national parks have also never exactly been bastions of preservation, the national forests have been far less so. In fact, a case can be made that many of the lands previously set aside are less preserved than they might have been had Roosevelt never been president. However, we are not really here to talk about the historical Theodore Roosevelt. We are here to talk about Teddy the myth. While it's worth knowing about the historical complexities of Roosevelt in order to understand a lot of the environmental controversies today, some will argue that the value of the story about Teddy and Yellowstone rests not in history but rather in the idea that there is a great virtue in philanthropy. Great men do great things, and one of the things that great men do is preserve beautiful places for all posterity. Perhaps, when we contradict the Teddy myth, some will say we are contradicting the supposedly great virtue of magnanimity. To the dismay and perhaps the disgust of many, I am here to dispute the Teddy myth. Even if Teddy Roosevelt had not been the man whose historical attitudes and actions disgusted me, even if he had been a man closer to what the mythology tells us he was, I would still find nothing to celebrate in the myth of Teddy Roosevelt. Why? The entire story of Teddy Roosevelt, as well as the campfire story to follow, suggests that we are indebted to the foresight of particular people for the goods we have today. We see this over and over again in people's stories about the Founding Fathers, in the celebration of war leaders, and the like. Unfortunately, these stories reinforce the notion that great men (or people, but more commonly men) make history and therefore our present reality possible. This worldview suggests that there are lesser people who don't matter in the story and that there is an act of power on the part of the magnanimous person that is fully appropriate, especially if the consequences of the act are desirable. We give our gratitude to our great "Fathers;" this is called patriotism (which essentially means "father"). Implicit in this view is the idea that places like Yellowstone are there for great people to provide for us. Without these great men, there would be no such place. Secondly, implicit in the view is that it's good that great men provide for people in the way that fathers provide for their children. Hence, we see over and over, Presidents of the United States gladly take on the patronizing title of "Great Father" in communicating with indigenous people. Unfortunately, men have used the analogies of parenting in order to assert their moral authority not only over other people but also over the environment itself (which unfortunately has been used in reverse to suggest the political rule of parents over their children - a discussion for another time). Just as some men of Roosevelt's time asserted their authority over lands held by American Indians, others asserted their mineral, water, and agricultural rights over land. The general run of paternalism is the illegitimate placing of one person over another. Where that separation exists, the fundamental relationship between beings is destroyed. Unfortunately, given this hierarchical dynamic, some will talk about the enlightened despots, the benevolent dictators, and other fanciful creations of human minds who are somehow virtuous despite the place they hold for themselves over other beings. In the American context, where we pretend that representative democracy is either truly representative or a democracy, we shy away from such brutal terminology; however, the idea is the same. Great leaders provide for all of their people. Yet, we do not ever belong to any of these people, and any act that perpetuates the notion that great leaders are doing us a favor perpetuates the arbitrary divide between people. Furthermore, no one owned Yellowstone, and no one was entitled to set Yellowstone aside (for the reasons for that point of view, please see these essays I wrote earlier this year). Stuck in this myth is the idea that people are lords over the land who may do good or ill with it; and we should be thankful for the lords who do good for the people and their land. They rule and give to people; they rule and do good with land. Yet, there is a fundamental problem in this point of view. It keeps us who are left out of the politics of the great deeds from being able to be actors in the relationship with the land. Today, we expect government to do this, or this corporate interest to do that, or this NGO to do such and such. It is their responsibility; it's not ours. We praise the politician who does not sell out; we decry most of those who do. However, for ourselves, we have nothing to say. We are common and don't aspire to greatness. We can't all be as great as Teddy; all we can do is our own part. It presumes that greatness is the credential of the few and that great acts belong only to them. In truth, they never had the entitlement to these acts in the first place. In historical truth, of course, many actors had some role in creating Yellowstone National Park. Grant did not establish Yellowstone; it was established by an act of Congress, passed by both houses, introduced by members of the Congress at the request of citizens, some of them belonging to the Northern Pacific Railroad. That reality was made plausible by lobbying efforts, art and photography, evidence from explorations, newspapers accounts, magazine accounts, speeches, and so on and so forth. Yet, even those acts, as myriad as they are, still don't get the point that Yellowstone owes us nothing for setting it aside as a national park. By lifting up Teddy the great land preserver, we pretend that there is something good about a system that keeps people divided from their leaders and keeps people divided from their land. It's fundamentally disempowering; it's fundamentally backwards. As a myth, it should therefore go by the wayside. It's not only a historical monstrosity to attribute this to Teddy Roosevelt, it's a mythical one as well. For much the same reasons as the Teddy myth should be set aside, the campfire myth should be set aside as well, though it is a better myth than the Teddy myth. Cornelius Hedges supposedly spoke out against all the schemes that the members of the Washburn Expedition (minus Truman Everts, who was lost on his own remarkable journey) had in dividing up the lands for their own good. He supposedly said that Yellowstone should be set aside as a national park for all the people. In a subtle way, this is different than the Teddy myth. While most of the members of the Washburn Expedition were prominent citizens of Montana, no one has really ever heard of them. For a man like Hedges to have the foresight to set Yellowstone aside as a national park suggests not so much the idea of a great father doing a great thing but rather a common man doing a great thing for all common people. He might have profited; however, the Hedges story suggests not so much magnanimity but generosity of the human spirit. Isn't this just the kind of story we want to raise up in a national park, one set up "for the benefit and enjoyment of the people"? Certainly, a lot of other civilian administrators in the park thought so and continue to think so (even some who no longer believe in the historical veracity of the myth). While most likely historically false, one must admit that as a myth this is an improvement over the Teddy myth. We have to like the idea that any one of us might be able to do a great thing if put in the right circumstance. This suggests the heroism of the common soldier in battle rather than the great General. We have to like that idea just as we like common heroes, just as we embrace Huckleberry Finn and Rocky Balboa. It seems to fit in better with Western history; a history that embraces scoundrels of various types. We like this very much. Yet, here again, something is amiss. Why is Cornelius Hedges thought to be so great? Who is being left out of the myth? How can we not notice the irony of this adventurer being praised for a national park in a land that was already inhabited by indigenous people? That's not only historically relevant but mythically relevant as well. Hedges was not simply the common man; he was the adventurous common man. In that sense, don't we have every reason to ask by what right does he presume as adventurer to stake his point of view over the land no matter how beneficial it is to his people? If Neil Armstrong had claimed that the moon should be off limits to human exploitation, some would surely see that as admirable, but why does Neil Armsrong get to speak on behalf of the moon or anyone else who might come into contact with it? How does one person's act speak to the relationship that all of us should have with a place? The myth doesn't just say, "Wouldn't it be nice if no one profited off of this land?" The myth says that they all took the idea seriously and strove to make it happen. It's not a fanciful idea but a call to action, a particular call to action that doesn't take other people into account and certainly doesn't take the land, animals, and plants into account. The land is still beholden to the whims, however benevolent in intent, of humanity. Again, the problem is a sense of entitled place in respect to everything else. It's certainly more empowering to suggest that one day we might be adventurers who do good deeds; however, what good is that if our fundamental sense of entitlement is so out of whack? When American soldiers go to Iraq, I'm sure there are still many of them out there doing good deeds. Some defuse bombs that would kill people indiscriminately, some offer medical care to all sides, and yet the war in Iraq remains paternalistic at its core. We think of Iraq in terms of what "we can do" for the Iraqi people. Or, some who are less generous think about what we are doing in Iraq can do "for the American people." Yet, throughout this, so many people and things are being left out. No one thinks of the desires of the land, the water, the people who are being "helped." Just being part of that, even in the role of helping, fundamentally preserves the illegitimate hierarchical attitudes we have toward other beings. In just the same way, the campfire myth does the same. Christmas in Yellowstone is unlike the other myths in that there is nothing inherently paternalistic about it; however, as presented reinforces some exclusion. Perhaps, slight changes to the myth might suffice. I must admit that I always loved Christmas in Yellowstone. During my summers in the park, I perhaps enjoyed no other tradition more. We'd get to dress up, decorate the store, and play holiday music. On two different years, they even put my frame (at the time, about 145 pounds) into Santa Claus outfits. I always hated the idea of Santa Claus, but the temptation to act was too great. We had laughter, fun, and great food. There were employee skits, gift exchanges, and a sense at times that it really was Christmas. Last summer, I was in Yellowstone on August 25 and was staying in Canyon Village at the time. Each day, I had at least one meal at the Fountain in the Yellowstone General Store. It seemed that I always had the same waitress from Poland. She and I talked a bit about her experience in the park, and she felt that her employers had not been upfront with her. She was struggling just to raise the money just to get back to Poland where she was a medical student. During one of our conversations, I mentioned that the tradition of Christmas in Yellowstone was not what was being told in the store. She spoke closer to my ear, "It doesn't surprise me; I don't trust anything these people tell me." In the same store, I talked to an older worker who was dismayed that Christmas was being de-emphasized by Delaware North, who operate the general stores. The worker said that their bosses felt that "Christmas" was too religiously exclusive and that they were to say the more politically correct, "Happy Holidays." I mention the two stories to bring out a couple different sorts of ideas. The waitress from Poland had already dismissed her employers as liars; for her, there already was no Santa Claus. The myth of Christmas in Yellowstone was meaningless to her before I even opened up my mouth. For her, it was a work day to deal with a reality that was different than one promised when recruiters sought employees in Poland. At most, she could say it was good because the older workers had something to enjoy. In the other, the myth had lost its force because it was being challenged paternalistically by those who would enforce greater openness and sensitivity to people with different traditions. Indeed, the Christmas myth is not necessarily one that appeals to non-Christians. It hearkens back to traditions of the wealthy people who frequented the grand hotels as the stagecoach era was giving way to that of the automobile. The United States and the West in reality was always more diverse than the image many have of it, but the spontaneous celebration of stranded visitors still speaks to old fashioned values. For some, those old fashioned values are the racist and intolerant ones that were in fact true. Most people, however, would not put such a cynical spin on the tradition; I suspect that most people simply thought of it as a homage to Yellowstone's peculiar and extreme weather. It was a witty joke on the tourists, a way for workers to celebrate together. It was never intended to be exclusive but inclusive, and that's the way most people see it - and perhaps rightfully so. That the history involved employers pulling the wool over the eyes of their employees - as employers are prone to do - is not particularly relevant to the myth, which puts the foundation squarely in the hands of people spontaneously coming together with a shared affinity for celebration and play. That by itself is a beautiful idea. Yet, as long as the myth of Christmas in Yellowstone remains in the hands of the employers and not the employees, the myth isn't fully folklore. Furthermore, until the myth does fully embrace the idea of inclusion, then it's not a myth befitting of a place where the enjoyment of people and the protection of plants, animals, and land exist in one place. That is, Delaware North is not wrong to suggest that the Christmas myth is not fitting for all people or all employees as it is commonly told and that there is a contradiction in that. Yet, it's odd that they are the arbiters of the myth. Thus, the criticism of the Christmas in Yellowstone myth is more measured. Perhaps, if the myth wasn't owned by the concessionaires but was rather truly shared spontaneously by people who sought to be inclusive - which is in fact the spirit of the celebration - it would better hit the mark. During all my years, though workers did the vast majority of the planning, we all did so within the confines of management. Christmas in Yellowstone was never truly a choice. Though many of us loved it - some did not - how ironic that all the while we were still confined to the actual history we didn't even know about. The employers created Christmas in Yellowstone; they still held the reigns. Making it "Happy Holidays" from on high makes it no less so even if that's exactly the direction we should take it. Finally, Jellystone reinforces many of the same perverse ideas that people have about what Yellowstone should be. I'm barely old enough to have seen the old Yogi Bear cartoons, and I frankly don't remember them too well. I remember imitating Yogi's voice, "Hey BooBoo." To be honest, I don't remember much if any association with Yellowstone National Park, which I rarely if ever thought about throughout my childhood. Like many people I come across, I doubt I would have been able to say much more about the difference of Yosemite to Yellowstone than that Old Faithful was in the latter (and many can't say that much). And, yet, to this day, the idea of Yellowstone as Jellystone is very strong. I remember so clearly people coming up to me and with a smirking grin on their face ask me where Yogi Bear was, as though I had never heard that one before. That idea may have been reinforced by the images we still occasionally see of a Yellowstone where black bears begged for food on the side of the roads, by amusement parks, by campgrounds that exist all over the country - some named Jellystone - where all kinds of modern conveniences exist. The myth represents to us a place of fun, amusement, where bears and humans can interact and have personality. Why would anyone want to put a damper on that? Anyone who has driven through Yellowstone knows that when there are significant numbers of cars parked by the side of the road, an animal of interest is near. The larger the number of vehicles, the more likely it is to be a bear. Perhaps, that anecdote is literally false - I have not done the measurements - but we know that there is a great deal of truth in the statement. No one pulls over for pine trees; no one pulls over for chipmunks; no one pulls over for the vast majority of things that exist in the park. Yet, bears have a particular pedestal in the public imagination, a pedestal that existed long before Yogi Bear and even long before Yellowstone became a national park. Nevertheless, Jellystone reinforces the relationship with Yogi Bear as almost worthy of us. Of course, he's not as smart, tends to do stupid things, and needs a wise human like Ranger Smith to keep everything together. The bear essentially is the human pet, there for us. So too is the park; amusement is defined by the goodies we can play with. What can be more amusing than talking bears! My sense is that the National Park Service has long been embarrassed by the Jellystone myth and has sought to distance itself from it; nevertheless, it lives on. It lives on in the recreational industry, who would turn Yellowstone into a playground of snowmobiles. It lives on in the disappointment I heard from many that Yellowstone doesn't have golf courses, has too many rules, serves its animals and features more than it serves its people. In dealing with the push back on services, the Park Service and its concessionaires have created hotels, offered fireside ranger programs, and in recent years brought satellite television and wifi into the dormitories and cell phone service into the park. Long ago, Yellowstone opened its doors to our favorite toys - our cars. While humans going back so many thousands of years have had an active role in the Yellowstone ecosystem and play is an essential part of living, the way we play is just as important. If our sense of play is to create a hierarchy of animals and treat the ones who might just talk back to us as the ones most dear to us (however subservient they remain), then Yellowstone will always simply be an extension of Jellystone. If play, however, can be something else, something that doesn't exist on a playground of better and worse sorts of beings, then Yellowstone could be something else. We might be able to take something from even the worst of myths. I have no idea how one might even begin to salvage a myth like Jellystone, or for that matter, most of the other myths considered. Yet, each speaks to something perhaps that makes my own condemnation seem harsh. While the Teddy myth perhaps is bankrupt in so many respects, it's certainly worthwhile to believe that people before us were virtuous. We would like to give thanks for something. It can't all be bad, and it's not. Our fond memories of play, of opening presents, of discovering new things for ourselves, of adventure are not bad instincts or bad memories even if some of the myths that inspire these things are not helpful. We cannot destroy the spirit that gets joy from these tales. Thus, we need to ask ourselves what's to be done. That is, how might we re-mythologize Yellowstone? We will have to consider that next time. All the same, we cannot look uncritically at the past as though it is innocent. That myth is not compelling and is often used to perpetuate the injustices that exist today. We need, as the lyricist once sang, "new dreams tonight" (before his idea was to use the magnanimity of great leaders to rid the world of poverty and AIDS). "How long must we sing this song," - dear Bono and everyone else. Now that we have looked at the relationship of false beliefs about Yellowstone to myth (Part 1) and argued that the particular myths considered are harmful, we cannot draw the conclusion that our stories of Yellowstone should not be shrouded in mythology. Even if not all myths about Yellowstone are good myths, if any place lends itself to mythology, it's a wonder like Yellowstone. What kinds of myths might we dream? Essay series thesis: Many of the traditional myths about Yellowstone National Park are not only false, they are far worse: They point to ideas that are wrong about society at large, reinforcing exploitation and disempowerment. Nevertheless, Yellowstone lends itself well to myth; we should consider new ways to celebrate this magical place. Part 1 considers some false beliefs commonly held about Yellowstone, the relationship of those false beliefs to history and myth. I argue that while myth can be at least as worthwhile as historical veracity, not all myths are worthwhile. Some historically false things are commonly believed about Yellowstone. Here are some things called myths that are not historically true about Yellowstone National Park. Many people believe that Teddy Roosevelt founded Yellowstone National Park. This is not historically true; Teddy had absolutely nothing to do with the establishment of Yellowstone on March 1, 1872. Teddy did not only not found Yellowstone, he did not originally protect the lands surrounding Yellowstone, and he did not found the National Park Service, which was actually founded years after his Administration when Woodrow Wilson was president. The national park idea, specifically Yellowstone National Park, arose from Cornelius Hedges during a campfire discussion along the Madison River during the 1870 Washburn Expedition. This is perhaps not as well known to the average person, but this story is still told by many (and is still mentioned on a plaque outside the Madison Campground Visitor's Center.) I first heard it on a bus tour in 1993 during my first full day ever in Yellowstone. For those who have studied the history of the park, the campfire story about Yellowstone proved to have powerful backers, including longtime superintendent and former National Park Service director Horace Albright. While no one knows whether the campfire story actually happened, documentation shows some version of the "national park" idea existing long before 1870 (whether one talks about England's parks, George Catlin's suggestion of turning the west into a national park, Montana Territory's acting-governor Thomas Meagher suggesting it of the Yellowstone area in the 1860s), and circumstantial evidence points to the Northern Pacific Railroad leadership in Philadelphia actually proposing and pushing the idea first. The only extant narrative describing the campfire discussions comes from Nathaniel Pitt Langford, but this narrative was not a diary but rather a journal re-written and published in 1905. Christmas in Yellowstone, celebrated by employees every August 25, originated in the 1920s when a freak snowstorm stranded visitors at the Old Faithful Inn, who spontaneously decided to celebrate Christmas. This, perhaps to the surprise of many former employees, is historically false. I also first heard this on the same tour of Yellowstone on my first day in the park and didn't know that the tradition was false for many years. We would hand out explanations to park visitors telling them why we had decorated the store for Christmas. I have never tracked down a definitive explanation, but apparently Christmas in Yellowstone was invented in the 1950s, most likely by Hamilton Stores. In fact, there were no freak all-consuming snowstorms in the 1920s during August. It does occasionally snow on August 25; during my first summer, there were a couple morning inches on Craig Pass. All the same, a blizzard that stranded everyone on August 25 would be highly unlikely. Yellowstone National Park gets its name from the yellow sulfur walls of the Grand Canyon of the Yellowstone. Many perfectly respectable people (including the Yellowstone historian Chittenden) have thought this was historically true and assumed it was true, but it's extremely unlikely. The Yellowstone River got its name from Minnetaree Indians who lived hundreds of miles away near the mouth of the Yellowstone. These agricultural people (i.e. not nomadic) apparently got the name from some sandstone bluffs near the mouth of the river. Indigenous people living nearer to the present day park did not call the river Yellowstone. The translation from the Crow, for instance, who lived along the Yellowstone and moved in and out of the park, was Elk River. Thus, the river, which gave its name to the park, did not arise from the striking yellow features in the park. Jellystone is synonymous with Yellowstone. In all seriousness, you would be surprised how many people come to Yellowstone surprised that the stores do not sell much of anything involving Yogi Bear, Boo Boo, or Ranger Smith. I think we sold some magnets a couple of years and ultimately dropped even that product. When going to Yellowstone, many will ask how "Jellystone" was. While very few people believe that Jellystone is actually Yellowstone, the myth of a campground/amusement park like Jellystone is quite strong still in the American imagination. There are, of course, many other things about Yellowstone that are believed but that are not historically true. Visiting the vast majority of blogs that talk about Yellowstone while compiling the Yellowstone Newspaper, you will read things that simply are not true. For instance, one blog reported that the Yellowstone fire of 1988 was the largest fire ever recorded in the United States. As reported last week, I was amazed to see on the White House Web site that someone designing trivia questions for the White House believed that Benjamin Harrison established Yellowstone National Park in 1891. Of course, that goes beyond myth, but we'll talk about that in a bit. In blogs, Yellowstone is synonymous with great size - such as in "He would have hit that out of Yellowstone Park" - but Yellowstone is not the largest national park in the United States ( a geographic, rather than historical, falsehood), though it is bigger than the states of Delaware and Rhode Island combined. Old Faithful never used to, in recorded history, go off on the hour, every hour. It is not the largest geyser as some may think. It's not the largest predictable geyser (a geological falsehood). No one shuts Old Faithful off at night (a geological and a political falsehood). Old Faithful is not synonymous with Yellowstone National Park (another geographic falsehood). It is not true that all buffalo in the United States come from the two dozen that remained in Yellowstone at the turn of the century. Here is a little of my own history with myth as a renegade student historian who held myth in higher regard. Let me set aside all these historical falsehoods for a moment and relate a story (a myth, perhaps) about my own history with mythology. Less known by those who follow me is that I didn't only major in philosophy as an undergraduate. Ultimately, I double majored in history. I found that all my electives seemed to be history electives, and so it was natural for me to follow through and complete the second major. However, I was always an outsider and renegade to the history department. Why? I was an enigma to some of my history professors because I was and am a skeptic of historical truth. Historians reconstruct the past from evidence that exists in the present; there is nothing indubitable about the results of their various methods. The most a historian can give you is a likely story, perhaps, highly likely, of what happened. In the end, though, there is not a hard line between historical truth and the myths that many historians are at pain to make distinct from what they do. A historian will retort, however, that myth makers don't use empirical methods, the myths aren't tested, and they don't have to conform to the laws of physics. While myths at some level must be internally coherent at some level, there is never any reason to believe that the myth actually corresponds to the reality that the historian is constructing. Both may speculate, both may be dubitable, but history because of its method crafts a more likely scenario. Nevertheless, as true as all that is, "more likely" and "never the twain shall meet" are two very different kinds of distinctions. History and myth are distinct in terms of method and probability about the past, not in terms of absoluteness in respect to truth. Being a person religiously minded, I wasn't all that interested in likely truths, in pursuing a science that was only going to tell me likely stories about the past. I found myself interested in the past as a kind of hobby, a pastime, not as something terribly important to the big questions of life. I became skeptical of the saying that those who don't learn history are doomed to repeat it, realizing that whatever value judgments that are garnered from history mean nothing without the lens of reason, without being able to ascertain similarities and differences, without understanding rational principles. It wasn't history, then, that was the key to the future, but rather understanding anything (past or present) simply in terms of what could or could not be known. What was worse about history was that it stood still, that one could not engage history in a conversation, one could not test it for its wisdom, see anything more than what the historian chose to tell us. History as it is told is highly interpreted and highly censored. We only see what someone has thought it important to share. All kinds of people did all kinds of things, all kinds of beings have been actors, and yet we are all told many versions of the same kinds of stories. So, to have a likely story about something that wasn't going to give me any insights and which was highly censored based on the value decisions of the historian, was even less interesting to me. History was one path; mythology was another. I know that there was no Zeus on Mt. Olympus, but to know about Zeus, Metis, and the Titans, gave me an insight, however unsatisfying, into the relationship of truth, deception, and power in our lives. Having rejected the universality of historical truth, I was forced to say that I didn't know for sure whether this guy Jesus I believed in actually was crucified and rose from the dead, however likely it was then to my mind that such a man existed. Yet, the story of redemption, of an actual man who was actually God, the thought of resurrection, whether 2000 years ago or 2000 years from now remained powerful for me (which lends itself to whole other volumes of discussion). The myth, its internal coherence, was more powerful and more true than the question of its historical veracity. It was freedom to realize that this historical religion, based in the acts of real people, did not depend upon proving the truth of history to prove the truth of the myth behind it. One falsehood about myth is that it is synonymous with falsehood. Myth is simply a story that points to some other truth. It may or may not be based in historical truth; that's never been relevant. Often, myths weave elements of history and fiction in order to point to truth. You see, I was not a very good history major (despite my good grades), not because I held onto the value of myth (many historians do, often as tools for understanding history), but for denying the value of historical veracity. If I had ever chosen to pursue graduate studies in history, I probably would have found trouble finding professors willing to shepherd me along in that discipline. It's no wonder I pursued philosophy, instead. My undergraduate professors loved me, in part because being the anti-historian, was refreshing to them. At least, I was something. At least, what mattered to them was a serious question for me. How many historians take their discipline so lightly, especially at the undergraduate level? Not everything historically false believed about Yellowstone is mythical. If we put these strands of this essay together, we see that I have begun by pointing out historical (and other) errors about Yellowstone, though many of these errors point mythically to a truth. We may want to believe that Teddy Roosevelt cared about the environment and left a legacy of national protection of wild resources. That to many is a useful myth. We might like to believe that altruism founded Yellowstone National Park - Hedges allegedly spoke up and aroused this altruism after a conversation where everyone talked about how they would divide up the land they had just "discovered." We might want to believe that common citizens (and a junior officer) aroused the altruism of a Congress that otherwise was consumed with pacifying the West through civilization. We might like to incorporate Yellowstone's unique weather and associate it with other traditions, like Christmas. We might like to believe that spontaneity and joy and giving and persevering in trying conditions are part of the Yellowstone experience (and some would say, part of the experience of Christmas and Christianity as well). On the other hand, whether Yellowstone gets its name from sulfur rocks or from the mouth of the Yellowstone, that story is not mythical. It's just false. The White House telling us about Benjamin Harrison founding the park inspires nothing in us (not even a comment) because there is nothing at stake the way there's something at stake about Teddy Roosevelt. Who is Benjamin Harrison to us except an ex-President? Teddy, though, is supposedly an icon; he represents something thought to be noble in the American experience (even if the truth is a man who was hardly against and an active participant in the genocide of American Indians in his own time and the rampant environmental destruction that helped make those chapters of the genocide real). And, like it or not, credible or not, Jellystone also is a myth, one of kind rangers, domesticated if silly bears, and of a place that is basically there for our amusement. The myth, fed by visions of bears feeding on the sides of roads, of the mythologizing of the ranger corps itself, of goofy American icons like the New York Yankee Yogi Berra, tells us something of the way many would like or would not like to view Yellowstone. No one believes in the historical reality of Jellystone--where can you even watch the old cartoons--but something of the Jellystone myth lives with a large number of people. When I was not amused by co-workers here in Washington, D.C., who told me to watch out for Yogi Bear, they noticed and wondered why I seemed to have little sense of humor about something as innocuous as Jellystone. The Yellowstone historian Lee Whittlesey along with prolific Yellowstone writer Paul Schullery published in 2003 Myth and History in the Creation of Yellowstone National Park. The book takes seriously the relationship of myth and history in the campfire myth. While the book comes squarely to the defense of their historian friend Aubrey Haines, who had done so much to call the campfire story into question, they also defend the myth of the creation story as one that's very useful for us. Perhaps, another time, I will comment on their specific claims, which are not handy to me at the moment (packed in a box waiting for a move to this mythical and quite real Wonderland). I mention the book only to say that I think I am going to say something different about this and the other examples that I have identified as myths than have Whittlesey and Schullery. While I love myth and have had a defiant attitude toward the value of historical veracity, not every myth is a good myth. I am struck, as are all students of the West, with the way that myth and history have intertwined in the West. The real life Wild Bill Hickock would wait in Kansas for passengers on trains heading West. He would meet them on the train tracks and tell them stories about himself, doing so in order to make more money. He really was some of the things he said about himself; his real history involved playing off the myths that already existed about him. The same goes for Buffalo Bill Cody who artfully weaved actual and false stories to the crowds at his Wild West shows in order to entertain and challenge them to determine what was real and what was not. P.T. Barnum's circus freaks, Ripley's Believe it or Not, and today's reality television all play with our love to figure out the puzzles of what's real and what is not. Barry Bonds breaks Hank Aaron's record, and we want to know how many of his home runs were real, how many enhanced, and how to set the record straight. Whether we can is not as important here as the notion that our history, and peculiarly the history of the West, has been infused with a self consciousness of the myth of the West while history is happening. That's why so many were so ready to take credit for creating Yellowstone National Park. How appropriate that for so long the best storyteller, Nathaniel Pitt Langford, was the one who won. However, as much as stories are part of the true history of the West, as much as they inspired future history that has since passed, we can't really say with a straight face that all these myths point to a good truth, can we? Do we really get a lot out of an outlaw West with John Wayne against the world, whitewashed for the world to see? If we consider the Wild West, the real Bill Cody employed - and for a provocative biography of Cody, please read Louis S. Warren's 2005 Buffalo Bill's America - many indigenous people (including Sitting Bull himself for a season) to tell the story of their demise and their domestication by the so-called superior civilizing white race. Racism was so a part of Buffalo Bill's Wild West that many of the shows began with a running of the races, where representatives of various races ran against each other. Depending on who won, a different racial morality tale would be told. For some pretty good reasons, a lot of those myths have dropped by the wayside, though the myth makers talking about Cody have often forgotten about them. Or, on the other side, the myth makers who hate Cody sometimes have forgotten that many Lakota still think highly of the man who gave them jobs and treated them better than anyone else would. My point is that no one really believes that all myths are equal, and so it is legitimate for us to ask whether there is any harm in believing that Teddy Roosevelt gave us Yellowstone National Park, whether there's harm in telling the campfire story about the founding of Yellowstone, whether there's harm in telling old stories about Christmas in Yellowstone, or harm in telling the Jellystone myth. If those myths are not worthwhile, and myths are in fact valuable, what myths should replace them? Teddy Roosevelt did not establish Yellowstone National Park, but is there something noble in believing that there was a great leader in our past who was so noble that he set this land aside? Is there something great in believing that preservation is consistent with the perceived macho masculinity of a man like Roosevelt, who was a trophy hunter? What could be wrong about believing in the values of noble altruism, in someone who understood his masculinity in terms consistent with preservation? Isn't that an ideal for us all to aspire as a people, a belief about our past worthy of our children? That will be for me to pick up in the next part (Part 2). In short, I do think this myth is a harmful myth that should not be told. I feel that way also about the campfire myth, and to a lesser extent, I believe it about the Christmas myth, and certainly about the Jellystone myth (which is probably the least controversial but perhaps not considered with the seriousness that it deserves).